Cheung's did a wonderful job on my wedding dress, she helped me decide on what alterations I needed done without getting super expensive since my dress had a lot of detail and the dress was done on the date promised! 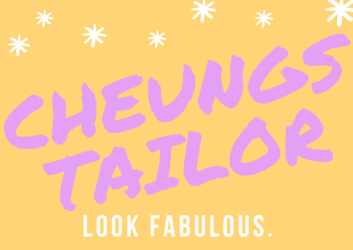 I would recommend Cheung's for anyone looking to have a special outfit altered! Thank you so much for helping me out with my wedding dress and flower girl dresses. Everything looks beautiful, wonderful customer service as well! Great Service! A good friend of mine referred us here after her mother had her wedding dress done. Amazing work in amazing time we will be coming back. Thank you so much for perfecting my wedding dress. You had amazing suggestions particularly for the bustle. Your attention to detail was exquisite. I loved how my dress turned out! A very happy customer. Thank you so much for the fantastic alterations to my wedding gown. The dress looks better than I ever could have imagined. You were so personable and I greatly appreciate your customer service! My gown shows that you take great pride in your work. Thank you, thank you, thank you. I will make sure to continue coming back for all of my alterations needs and I will tell all my friends and family about you! I am so excited for the big day now! Thank you for doing such a fabulous job and going out of your way to make it perfect! Working extra hours to make it last minute. You're the best, the dress is what I imagined and better. I will always recommend you to my friends and family. You have our business 🙂 Thanks again. ~Tiffany "Taylor"
"I feel like a princess"
Thank you so much for altering my wedding dress. you did a fabulous job and the dress fits perfectly. I feel like a princess. You were so wonderful and nice to work with. And, thank you for the gift and card. That was very sweet of you. I had wedding too big in the bust and sides. Helen did a wonderful job on my dress. I will definitely be recommending her to my friends and family. She has very reasonable prices as well. Thank you Helen! Helen provides excellent customer service, quality of customer service and the work performed. She made me look very beautiful and i was helped in a very comfortable stress free environment. Thank you. I will make sure to continue coming back for all my alterations needs and i would highly recommend her service to all my friends. Thanks again! I brought my wedding dress in with only a few weeks until my wedding, my dress was finished with plenty of time to spare and it fit perfectly! I will definitely be back for future alterations. Thank you! Over the past couple years we have been renovating our customer experience in the store. What we have learned is that we were unable to share that experience with new clients online. As we build out our online experience for future clients we hope that you enjoy what a small percentage of our past and returning clients are saying. If you come in for a free consultation we have the original testimonials and pictures for you to reference – along with hundreds of more examples! To preview additional pictures and testimonials please check out our work!